It helps to cover all types of problems related with the nervous system. Best used for Sciatica, Migraine and Cervical spondylysis. 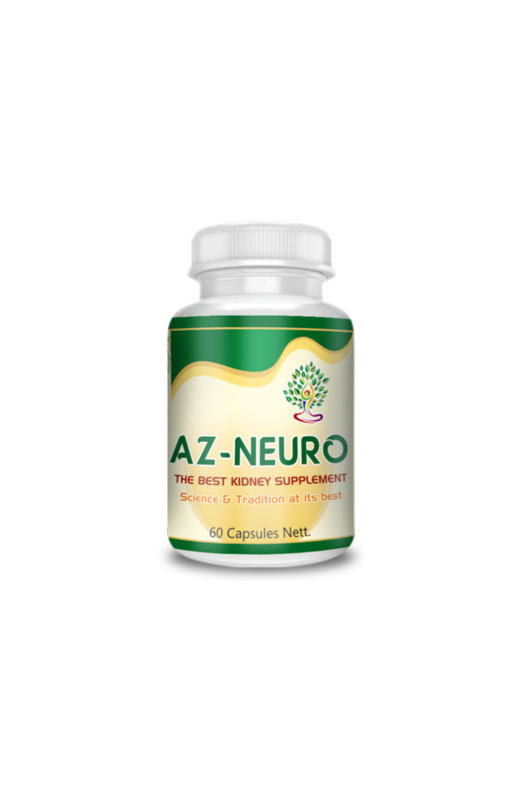 AZ-Neuro helps to repair damaged neurons by enhancing proteins involved in the regeneration of neural-cell. It supports your body in adapting to stress by nourishing your nervous tissue. It is considered to be a nerve tonic and sedative agent that can help treat fatigue and control your nervous system by addressing nervous exhaustion. AZ-Neuro acts on brain, blood vessel and heart muscles to add strength. It strenghens bones. For joint and nerves. It decreases pain, tenderness and swelling. Best for lumber pain, lower back ache and cervical, for nervine pain like neuralgia and neuritis, for muscular problems like myalgia and myosities, for arthrits and rheumatism. Unique product for migraine. Also used for nervine and brain weakness. Last but not least AZ-Neuro can be used as a detoxification purpose. Guggulu purified (commiphora mukal) - Uggulu works on all tissues of body and is effective in rejuvenating body tissues and increasing strength. Fresh guggulu is useful in weakness and loss of weight . Iron oxide (loh bhasam) - It is useful in gastric complaints, skin diseases, eye disorders, bloating, splenomegaly, helminthiasis, obesity, diabetes, vomiting, asthma, bronchitis, herpes, abdominal colic, chronic respiratory disorders, liver disorders, piles, fistula, chronic diseases, emaciation, muscle wasting, dizziness and delusion. Mica (abhrak bhasam) - It is used in the treatment of digestive impairment, malabsorption syndrome, disease due to kapha dosha, asthma, bronchitis, fever, bleeding disorders, cough, cold, urinary disorders, diabetes, anaemia, skin diseases, splenic disorders, ascites, helminthiasis, etc. Silver oxide (rajat bhasam) - It is used in ayurvedic treatment of memory loss, dizziness, excessive thirst and diabetes. Pyrite (swarna makshik) - It is useful in the treatment of diabetes, helminthiasis (intestinal worms), eye diseases, urinary tract disorders, hemorrhoids, skin diseases, anorexia, insomnia, inflammation and poison.